“Drew, you’re tired, huh? You had a rough night?” Miki Naftali, founder of the year-old Naftali Group, is teasing his 26-year-old director of development, Drew Popkin. Popkin is a good sport. “It was a long night,” he replies from his seat in the windowed conference room of the firm’s new 5,000-square-foot office at 1700 Broadway. “You’ll tell me after this [interview] what happened last night,” his boss says with a laugh. Lightning rod though it was, the Plaza conversion was a moneymaker for Tshuva, with its condo units selling out for some $1.4 billion. And Elad is now in the process of selling its stake in the hotel to Sahara India Pariwar for a reported $575 million. The same cannot be said for the company’s 2007 purchase of the Frontier Hotel in Las Vegas for $1.24 billion. Partnering with Israeli tycoon Nochi Dankner, Elad demolished the hotel with plans for a Plaza-themed resort. But the project never got off the ground, leading to a reported haircut of 45 to 60 percent for Tshuva and Dankner. But Naftali said he’s been received well by lenders because of his history of completing Elad projects in New York. Naftali said his track record is what’s enabled the fledgling firm to find three different equity partners and secure over $140 million in construction debt for its 400,000-square-foot New York City portfolio, at an overall portfolio debt rate of around 2.5 percent. “That rate, for that amount of debt, is very rare,” Popkin said. Naftali seems excited — and relieved — to be out on his own, free of the trappings of running a big company. Naftali is fond of saying that he left Elad on June 30 and founded the Naftali Group on July 1. The newborn firm didn’t even need to move from its offices at 575 Madison Avenue; those who were staying with Elad simply moved from the 23rd to the 22nd floor. (At the time, Naftali owned a 49 percent stake in Elad Properties, a New York subsidiary of Tshuva’s Elad Group. Elad Properties has now been dissolved.) In March, the Naftali Group moved to 1700 Broadway. Naftali took with him a small team, most of whom had been working with him for years: Victor Sigoura, the Naftali Group’s chief investment officer, had been at Elad for six years. Other Elad veterans include Popkin; Michael Witek, the Naftali Group’s vice president of construction; and Eva Malachi, the firm’s vice president of operations. The firm started looking for deals immediately, cold-calling building owners in targeted neighborhoods, Sigoura recalled, and spreading the word that they were looking for equity partners. Within a few months, the company had purchased four small existing apartment buildings, all with “some type of distress or situation [where] we thought we could really create value,” Naftali said. 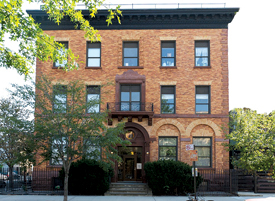 The first building, 65 Maspeth Avenue in Williamsburg, had been developed as a condo but “during the financial crisis, they had real issues,” Naftali said. Originally planned as a 24-unit condo, 64 Maspeth was nearly complete but had sat vacant for three years. Naftali negotiated with the lender to buy the note, took title to the building and secured a bridge loan. Within five months, his firm had completed the project, leased out all of the units and refinanced the deal. Also in Williamsburg, the firm purchased 484 Humboldt Street, a rehabilitation of a former schoolhouse. And in an off-market deal with the same seller in late 2011, it purchased 200 Franklin Street, a 12-story tower with 19 residential rental units and 10,000 square feet of retail space in Greenpoint. Naftali hired the brokerage aptsandlofts.com to handle leasing for the properties. All four are now leased out for rents in the “upper $40s” per square foot, according to David Maundrell, head of aptsandlofts.com. But Naftali wasn’t just looking for existing rental buildings — he was also gunning for development sites. The team found a stalled development site at 267 Sixth Street, on the corner of Fourth Avenue in Park Slope, and purchased the note for $10.7 million. Together with Chicago-based Pearlmark Real Estate Partners (formerly known as Transwestern Investment Company) they’re in the process of building a $39 million, 104-unit ground-up rental, which is slated for completion in 14 months. The project had already been fully designed by the architect Karl Fischer, but the Naftali Group worked with him to rejigger the layouts to better target the Park Slope market. They also hired designer Andres Escobar to create “really cool spaces,” including a gym, residents’ lounge and a roof deck with cabanas, Naftali said. Based on comps from nearby Arias Lofts, he said he’s hoping to rent out the units for around $55 per square foot, or more. The Naftali Group has also partnered with investment management advisor AEW to buy a 90,000-square-foot development site at 316 Bergen Street on Third Avenue in Boerum Hill. According to public records, the partners paid $6.72 million for the site in a deal that closed in May. They plan to build an 85-unit rental property there, designed by ODA Architecture. Maundrell said the units are expected to rent in the low $50s per square foot. He also noted that he admires Naftali’s foresight in purchasing development sites at a time when many other developers were shying away from ground-up construction. He said that land values in the area have already risen since the firm snapped up the two development sites. According to a May report by the brokerage MNS, average rents in Brooklyn are up 10 percent from the same period of last year and 40 percent in Park Slope. The average one-bedroom in the neighborhood now rents for $2,356 per month. Naftali said his firm is aiming to take advantage of the current high demand for rentals in the area. Another likely reason for the emphasis on rentals, sources noted, is that it’s currently easier for developers to finance rentals than condos, where lenders want 40 to 50 percent equity, compared to 5 or 10 percent in the past. The team is currently determining the appropriate unit mix for the project, she said. The Naftali Group is also slated to close this month on a deal to build a 150,000-square-foot, 30-story tower in the Financial District, but Naftali said he could not yet disclose details. The firm is also working on creating a platform to do deals outside New York City, he said, most likely multifamily properties along the East Coast. And it isn’t wedded to doing residential deals. “If tomorrow we find an opportunity in office space, we have the experience, we know how to do it, we’ll go after it and we’ll do it,” Naftali said. A native of Tel Aviv, Naftali started working as a property manager to pay his bills while in college at the University of Southern California. He worked with Tshuva for 21 years before launching his own company. Bespectacled and seemingly mild-mannered, Naftali is “disciplined and energetic and a workaholic,” said Dana Pecorella of the brokerage Cantor-Pecorella, who has worked with Naftali on a number of projects over the years. While at Elad, Naftali developed many New York condos, including the 215-unit Link at 310 West 52nd Street, the Grand Madison at 225 Fifth Avenue, the O’Neill at 655 Sixth Avenue and the 50-unit 21 Astor Place. But Naftali’s best-known — and most controversial — project was the Plaza. As The Real Deal and others have reported, problems quickly arose after Elad purchased the beloved century-old hotel and announced plans to convert it to condominiums. When Elad attempted to fire the Plaza’s 900 hotel workers, it locked horns with the hotel workers’ union, which helped launch a high-profile “Save the Plaza” campaign. Celebrities like Matthew Broderick and Liza Minnelli got involved, and Mayor Michael Bloomberg publicly pledged to help Plaza employees keep their jobs. Eventually, Elad agreed to scale back its plans, limiting the number of condos to 180 and keeping 282 hotel rooms. Then came the much-chronicled lawsuits, with unhappy buyers — like Russian billionaire Andrey Vavilov — claiming the apartments weren’t up to snuff. And in 2011, the Plaza’s storied Oak Room bar and restaurant announced that it would close, following a bitter rent dispute with Elad. Naftali left the company shortly thereafter, leading to widespread speculation that troubles with the Oak Room and other retail vacancies at the Plaza had led to his ouster from Elad. All along, Naftali has firmly denied that version of events. He’d long wanted to start his own company, he said, but felt he had to wait until the Plaza and 250 West, the Tribeca condo conversion, were on firm footing. “I didn’t want to leave and to basically create a situation where they [were] not ready,” he said. And while he acknowledged the challenges at the Plaza, he emphasized that the development was hugely profitable. Elad put some $1.1 billion into the Plaza, between buying it for $675 million, converting it to condos and restoring public spaces like the Palm Court. Some 51 hotel-condo units were then sold for around $200 million. When the condos hit the market in 2005, they quickly sold out for what Naftali says was as high as $7,000 per square foot. If Sahara India Pariwar pays, as expected, $575 million for Elad’s stake in the hotel and retail, that’s a total revenue of some $2 billion, netting Elad around $1 billion. Still, lenders and equity partners seem willing to give Naftali the benefit of the doubt, especially since he has a history of completed projects. Lenders these days are also very interested in “surety of closing,” he said, which the Naftali Group also seems to have in spades. Naftali is “lining up the money, he’s got the expertise and they’re getting cheap money,” Miller added. Some in the real estate community say that Naftali — and Elad — have been unfairly blamed for problems at the Plaza. The Marketing Directors’ Andrew Gerringer noted that the constant comparisons to the Zeckendorfs’ massively successful 15 Central Park West are somewhat flawed: That condo was a new, ground-up project, while the Plaza was a conversion of a historic building, which makes construction notoriously difficult. Pecorella, who worked as a marketing consultant at the Plaza, said the building was in disrepair when they bought it, and that Elad preserved as many original details as possible. She added that she was “heartbroken” during the controversy. Naftali, too, seemed heartbroken — and angry — during the hue and cry over the Plaza. Now, however, he seems much more at peace with the situation. His office is adorned with artifacts from the original hotel, images of Eloise, the Plaza’s famous fictional inhabitant, and a black-and-white photo of the building under construction in 1906. His job at Elad also involved “a lot of things that were not really part of what I like to do.” In 2010, for example, he took Elad Canada public, spending a year on the IPO process. Now he’s free to focus on his first love: development. To keep it that way, he wants to keep his current company small and efficient.